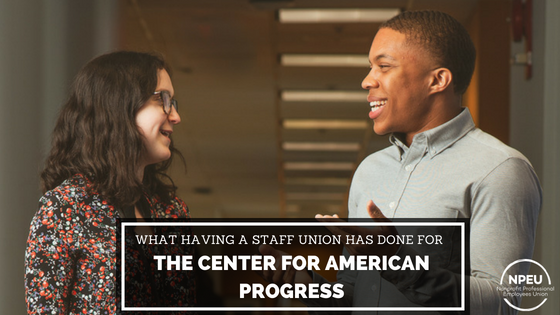 In January 2016, more than 90 staff members at the Center for American Progress received voluntary recognition as the newest members of the Nonprofit Professional Employees Union (NPEU). We chose to form a union because we saw it as an important opportunity not only to enhance our workplace experiences and culture, but also to support the very kind of institution that we know increases both economic mobility and political power. Just about a year ago, our union ratified its first contract. It’s hard to imagine our workplace without the protections and benefits we gained from it. Here are some of the highlights. Unit members saw significant wage increases under the contract, which established minimum earnings levels for five tiers of workers based on their experience and job duties. Prior to the contract, entry-level employees routinely earned $32,000. Today, no one in the unit is hired at less than $37,000 a year which, given the high cost of living in D.C., combined with the astronomical student loans that many of us are paying off, is a considerably more livable wage. On top of establishing these salary floors, the contract secured guaranteed annual raises for unit members as well as the chance to earn merit-based salary increases. Across the board, we’re glad to be earning salaries that are commensurate with our work experience and education levels, and that make our workplace more competitive with other D.C. nonprofit employers. Without paid family and medical leave, which the United States sorely lacks, caregiving obligations or an illness of one’s own can place untenable demands on workers. Fortunately, our contract secured up to 12 weeks of paid time off upon the birth or adoption of a child, as well as six weeks to attend to one’s own serious illness or that of a family member’s. Our contract is ahead of the curve in that it will allow people to take paid time off to care for a domestic partner, not just someone related by blood or marriage. It also allows people to use sick days to access care, shelter, or counseling if they or a family member experience domestic violence, sexual assault, or stalking. At a public policy nonprofit (and at any workplace, really), the importance of diversity and inclusion cannot be overstated. The contract establishes protocols that will make applicant pools more diverse and make our hiring processes more transparent. It requires the organization to conduct a pay equity analysis based on race, ethnicity, and gender, and to rectify any pay discrepancies that are found. It also requires the organization to conduct a climate survey, through which staff can provide candid feedback about their experiences on diversity, inclusion, and beyond. Historically, workers at CAP have been at-will employees, which means that management can fire them without cause. Under our contract, no unit member can be fired or suspended without pay for arbitrary and capricious reasons—management must have “just cause” to terminate an employee. Furthermore, in the event that a unit member is laid off, the contract requires that they be given a minimum of 45 days’ advance notice as well as severance payment, helping to cushion the impact of the lay-off. Remember when the Obama administration sought to modernize the nation’s outdated overtime rules by providing time-and-a-half to workers earning just under $50,000? CAP helped advocate for the change. That rule never came to fruition nationally, but management agreed with the union that it was important to implement overtime protections for all workers who would have been covered under that rule anyway. This way, most unit members have more predictable hours from week to week and, when we work extra, we’re compensated appropriately. The workplace improvements we’ve seen since May 2017 are just the beginning. If you’re interested in organizing your workplace, please reach out.